Do you think computers can be creative like humans? Sure, they are good at repetitive tasks that are just too boring for humans to do, Searching the web for pages on Star Trek or horse riding, for example. They can even play some games like chess better than humans. That's just done by searching through more possible moves than a person can. Does that count as creative? It doesn't seem, so. How about drawing? Cartoonists are creative people. If a computer could draw caricatures of people as good as people would that count as being creative? A group of computer science undergraduates at Queen Mary, University of London decided to find out. 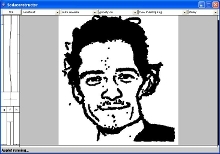 The result was that they created an Artificial Intelligence program that draws cartoons of people, choosing the most distinctive features of their face and exaggerating them just as human cartoonists do. Why not get it to do a caricature of you and decide for yourself whether it is creative or not.